I was on an online health and fitness forum the other day. 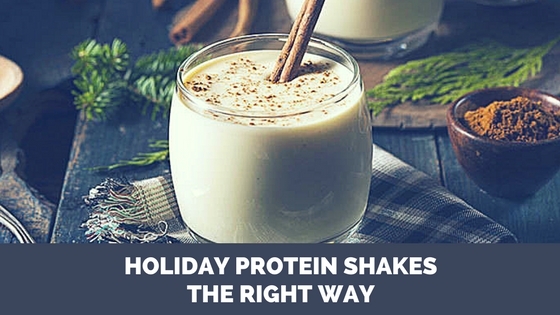 Someone posted this suggestion for a holiday protein shakes: 1 serving of your favourite protein powder combined with eggnog and a dash of cinnamon instead of just using water or milk. While I’m sure that would taste good, honestly that’s just really bad advice. I certainly get the appeal of having a holiday-inspired shake. I see the posters and ads for the holiday drinks at all the popular coffee chains. They look delicious and it’s easy to get caught up in the holiday spirit and treat yourself. But let’s hack the system and make our own shakes that keep their nutritional benefits and add some holiday flavouring. Try one of these two recipes (blend all ingredients until smooth). The secret is adding ingredients like peppermint or rum extracts that add a ton of flavour without adding many calories.